Leeds Rhinos got their first win in three matches against a Salford side that failed to score at Headingley. Tom Briscoe registered Leeds' opening try and Ash Handley capitalised on Niall Evalds' error to extend the lead. Kallum Watkins converted Handley's score - the centre's seventh try in his past four matches - and later kicked a penalty to give reigning champions Leeds a 12-0 half-time advantage. Another Watkins penalty and Josh Walters' try completed the scoring. After losing to Castleford and drawing with Huddersfield, Leeds' return to winning ways kept them five points behind leaders St Helens. 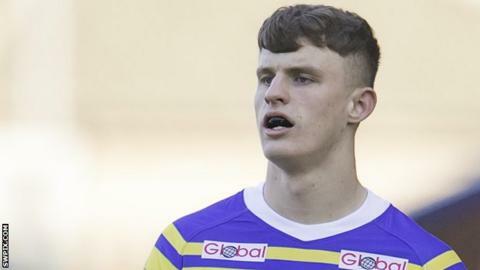 Handley had scored two tries in each of his previous three Rhinos appearances but he had to settle for just one against the Red Devils, who fell to a sixth defeat in nine matches this season. Jake Bibby came closest to scoring for lowly Salford, but a last-ditch tackle by Stevie Ward - making his first appearance since February's World Club Challenge defeat by Melbourne Storm - kept him out. "We lost Anthony Mullally through injury and if you went through our injury list and did it in size order, our five biggest men in the squad are out injured. "You try to contain any team that weighs heavier than you do and it starts to take its toll. You put it into context, that's why that was a really good performance. "When the injured blokes come back I'll be having words with some players that probably don't deserve to miss out and they'll be difficult conversations to have. But it's great to have those types of conversations." "They completed their sets and kicked well. When they had an opportunity to score a try they took it. "It was never going to be one of those fancy games where you can move the ball and throw it all over the place. It was about doing the tough stuff and I thought we did that for a large majority of the game. "We just didn't take our opportunities, but I know we're a good team and we'll be alright. Just because you've lost at Leeds it's not a big panic." Leeds Rhinos: Golding; Briscoe, Watkins, Handley, Hall; Moon, Myler; Delaney, Parcell, Singleton, Ablett, Ward, Walters. Replacements: Dwyer, Ferres, Smith, Oledzki. Salford Red Devils: Evalds; Bibby, Welham, Sa'u, Olpherts; Lui, Wood; Nakubuwai, Tomkins, Griffin, Jones, Burgess, Murray. Replacements: Littlejohn, Hauraki, Tasi, Lannon.